Understanding Interest on Overpayments and Underpayments, in Effectively Representing Your Client Before the I.R.S. : A Practical Manual for the Tax Practitioner with Sample Correspondence and Forms, 6th Ed. Editors: Keith Fogg, Christine Speidel, Patrick W. Thomas & Derek B. Wagner. 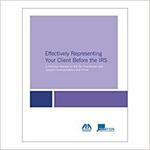 Effectively Representing Your Client Before the I.R.S. : A Practical Manual for the Tax Practitioner with Sample Correspondence and Forms (Keith Fogg, Christine Speidel, Patrick W. Thomas & Derek B. Wagner eds., 2015).